Add your own captions to "Hofmann Among Prophets" in the text box below. Exmormon: You see right there, I specifically said I want no further contact from the church! Kimball: But is this really legally binding on us? Romney: We can have the bishops blame future contact on the ignorance of kind hearted members. Packer: My plot to cover up the skeletons of the church seems to have backfired! Damn Internet! Spencer W Kimball: This find is really the bomb! Hoffman: If it wasn't for genealogical research I never would have found these documents! Tanner: You have any more of these Mark? Money is no object. Kimball: Damn, I wish I hadn't locked the seer stone up in the vault. This magnifying glass has smudges all over it. Romney: My bossom is burning, it must be true! Or it's my acid reflux acting up? Packer: My factory is tingling it must be true! Oh wait, it's always tingling. Spencer W Kimball: "No, I didn't realize that they used Crayola Crayons in the 19th century, either." 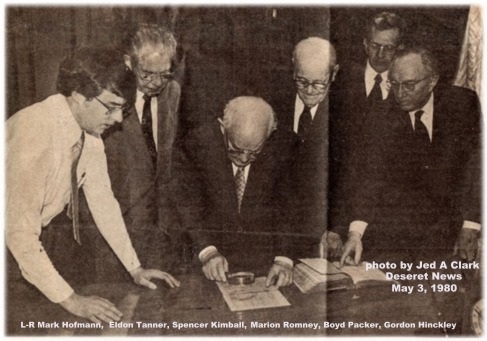 Spencer W. Kimball: Where am I? N. Eldon Tanner: Spencer, you're holding your Urim and Thummim backwards. Marion G Romney: I feel a salamander climbing up my leg! Mark Hoffman thinking to himself: I wonder if the paint is dried on the Sword of Laban yet? Gordon B Hinkley: Do you have to read re-formed Egyptian from right to left? Kimball: Mark, do you have any papers on homosexuality? Hinckley: If the Gentiles get a hold of this they will see this whole chapter here is made up! Packer: Who can sick the Danites after? - 03/17/2002 - Dave Y.